Understand how and why chords work together! Learn the simple rules that govern which chords belong in each key, how chords relate to scales, and ways that you can quickly play them. We'll also take a look at how you can build your own chords, so you'll never have to rely on chord charts again. After this course you'll learn songs faster than ever before and play with greater confidence! "I have been struggling with the theory aspect of guitar for almost 40 years now. For the first time in my life, I am starting to make sense of the scales, chords, modes, intervals and how they all relate to one another and work together to make music a fun and enjoyable experience once again. Discover the secrets of creating guitar riffs and solos that are laser-targeted to harmonize perfectly with the chord progression. Learn a completely new approach to working with the fretboard that doesn’t rely upon scale patterns! This course is a nice blend of theory with a heavy dose of practical application where you’ll learn not only numerous written solos developed specifically for four custom jam tracks, but you’ll also learn improvising techniques as well. I’ve heard these sorts of riffs/fills/lines/solos before (as you’ve mentioned, they’re in lots of songs!) and I always thought they sounded great, but I never really thought through how to play them. How did those guitar players know what pairs of notes would sound good? It was a bit of a mystery to me… After seeing your “Tasty Riffs and Solos” course, it all makes so much sense now. Have you struggled with matching your strums properly to the song? Unlock your creative side through your rhythm guitar playing! Say goodbye to boring strums, and get ready to explore the world of dynamic rhythm as you learn techniques to make the song rise and fall, purely through your rhythm. This guitar lesson builds on the concepts taught in Unlocking I IV V, and takes them much further into a deeper understanding of scales and how they relate to the fretboard. You will learn how solos come directly from the scales, and how you can play a scale or solo in any position you want on the fretboard. Specific scale patterns are demonstrated in close-up detail and taught in a way that will truly make your fretboard come alive in your hands. My guitar playing really has drastically changed. I can do an improv solo to just about any song my friends are playing now. I never thought I would be able to do that. My only thing now is trying to get faster, but I guess that will come in time. Feel intimidated by bar chords? There’s no need! In this course, you’ll learn how to play bar chords from the ground up, including tricks to ease you into them slowly, as well as finger exercises to increase strength & dexterity. Knowing how to play bar chords really opens up the fretboard for the rhythm player! 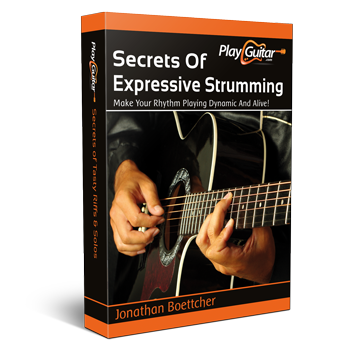 Want to take your rhythm playing to the next level? Covering everything from strumming techniques, flat picking, hybrid picking, chord theory, slipping riffs in between rhythms, and many more advanced strumming techniques, this course will truly bring your rhythm playing a big step forward. Make your rhythm playing so interesting, you won't even need a solo! This collection of 30 high quality blues backing tracks will seriously spice up your practice time! Playing over jam tracks is an excellent way to develop your ear as you learn to listen to the music and fit your own playing into it. Timing, fluidity and speed all improve as a result. This is a great way to work over new riffs you’re learning, or simply to practice your scales! 45 minute bonus lesson included. Since purchasing your 30 Blues Jam Tracks & videos, I started working with them and things are starting to make sense now. I like them so much, when I came down here to Mexico on vacation, I brought the tracks with and purchased a new guitar & amp to practice with. I look forward to purchasing more tracks when you get them finished. 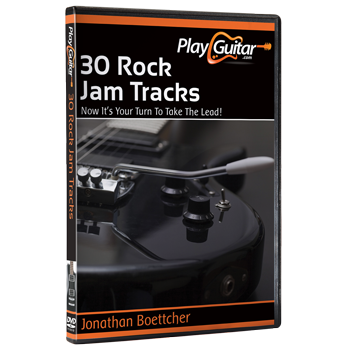 This collection of 30 high quality rock backing tracks will seriously spice up your practice time! Playing over jam tracks is an excellent way to develop your ear as you learn to listen to the music and fit your own playing into it. Timing, fluidity and speed all improve as a result. This is a great way to work over new riffs you’re learning, or simply to practice your scales! 45 minute bonus lesson included. "Your jam tracks have made a MASSIVE difference to my playing. I am 1000x better because of them." "Jamming to this track does wonders for my timing! What a difference it makes! Yeah!" "Your jam tracks are great and I feel like I'm back in the band again when I play along with them." Do you ever wish you had just a few more guitar riffs up your sleeve? 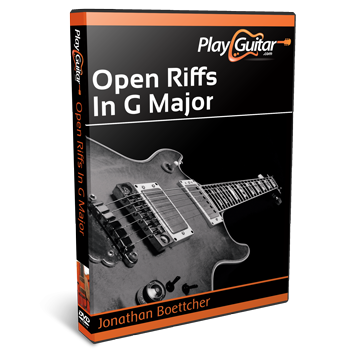 This short course covers a handful of cool riffs that work great with open-chord rhythm playing, all in the fabulous key of G major! Bass players – prepare to play like never before! Decoding the Bass Guitar takes the concepts that are covered in Unlocking I IV V and Guitar Scale Patterns, and applies them specifically to the bass guitar. You will learn how you can efficiently cover the entire fretboard using only two scale patterns, and furthermore you will learn how you can use the intervals in the scale to create riffs and fills like never before! I really dig the DVD. The info has helped so much just the few times I have watched it. I really wish this was available 20 years ago! My son has started to learn the bass and I am giving this to him. I do recommend this lesson for everyone and is a MUST HAVE for those just starting out. The more you watch it the clearer and clearer the fret board becomes. Having the ability to reach out and email any questions is such big bonus. GREAT Work. Amateur Musician... but getting BETTER!